Gucci has been on a roll lately. Celebrities everywhere have been spotted either sporting gorgeous Gucci couture or toting Gucci bags. Well, look no further cause Gucci's latest celebrity ambassador lives close to home. Li Bingbing - famous Chinese songstress and actress - was spotted at the Beijing airport wearing HTT [head to toe]Gucci and thank God it wasn't in a tacky way! She wore this luscious pair of Gucci tan and black printed calf hair loafers with gold horsebit detail and carried a FW2012 black brocade large Soft Stirrup Bag. Check out the gorgeous top-stitching and gold stirrup detail! And as if to prove a point that these weren't enough Gucci on her, she was also toting a Black GG Leather Carry-On Luggage with black leather trim and an Interlocking Watchpink gold with stainless steel and brown crocodile strap. Oh wait there's more, don't forget the GucciSilver Horsebit Contraire White Horn Ring. What did I say? Gucci HTT! 1) Wondering why the prices for these pieces are not as economical as they should be? Well it's because everything in the collaboration that is made of leather is actually made of real, genuine honest to goodness leather [including the coveted shoes!]. None of the PVC or faux leather business here. 2) All apparel purchased from the collection will come with gorgeous white-washed hangers and white cotton dust bags. Honestly, this is a PLUS considering the prices that's available for these pieces. Talk about fast luxury! 3) There are a few "surprise" items apart from those that we've all seen online. One interesting piece for the ladies would be these gorgeous pumps with a removable heel[worth SGD 199 a pair]. The heels are drilled through and laced with a ribbon, which you can detach and use as a necklace. Genius eh? Now let's talk about pricing. I have the updated pricing in SGD for my favourite pieces in the collection. One thing I want to highlight are some of the must have pieces from the men's collection - such as the hand painted loafers will costSGD299 a pop, the hand painted ankle boots will set you back SGD 399 a pair and for one of the most coveted pieces in the collab, the trompe l’oeil high-top sneakers is only setting you back for SGD199. Remember folks, these are Margiela designs in REAL LEATHER so these prices are actually AMAZING! For the ladies, check out the SGD prices above. Seeing these prices are making me want to queue up first thing on the 14th! Some of the pieces are priced quite well I must say, considering the quality and the amount of goodies that you'll get along with it. For more information on the pricing of the full collection, just visit H&M's website and you'll get the full list with product descriptions. See you all in the lines! It's literally less than 20 days before the launch of the Margiela for H&M collection and the hype for it is higher than ever. The launch party in NYC for fashion's elite has been lauded with much success - so much so that pieces bought from there are now out and about in eBay. Anyhow, as we fashion plebeians await for the collection's availability in stores on the 15h of November we can only tide ourselves with the pieces we're longing to have. Well, my list is as long as it can get. I tend to favour the ladies' collection [no surprise there] with pieces that I feel are unisex in any case. I'm in love with the coats and jacket selection and I'm hoping [against hope] that they would be suitable enough for "cold office" weather here in Singapore. The white sneakers are not bad either and I have a feeling that these would be one of the first pieces in the collection that would bid adieu. 3 of my absolute favorites would have to be the - oversized jeans which brings me back to my flare loving days in secondary school, the trousers with mini which are just so high fashion and finally the oversized pea coat. Well suffice to say, the men's line is as appealing to the high fashion junkie as the ladies' line is. I have quite a few pieces I have my beady eyes on but the highlights for me would have to be the jacket made of belts and the shoes - those gorgeous shoes. A couple of other noteworthy pieces would be the fusion jackets and coats. These look fairly pretty on photo but I'm keen to see them first hand before I pass final judgment. That's about it. Are you guys as excited as I am?? Can't wait for these pieces to be available in stores! Went into Givenchy the other day and I must say I just fell in love. With the FW12 collection in full bloom in shops, 2 of the pieces that I must say are to die for would be this black cape with leather detail and this knitted poncho with French lace and beads. They're just stunning pieces and as expected, stunning prices. I wasn't able to resist trying them on as they were just too gorgeous. 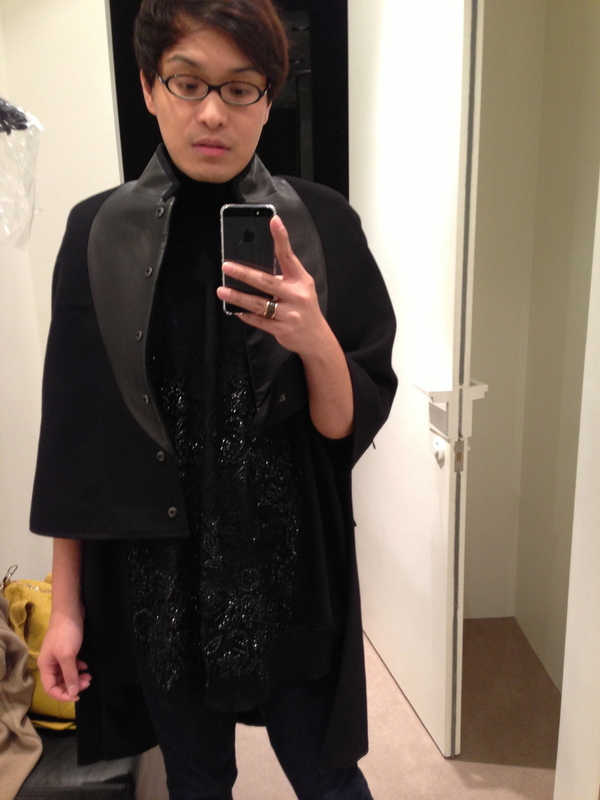 The cape [retailing for about SGD 5000] can be worn just on the shoulder or you can unzip the armholes as I've done so. It has this asymmetrical leather detail on the chest area that adds a tinge of sophistication and uniqueness to the look. The poncho, on the other hand, is one of a kind. Retailing for around SGD 4700, it's a piece that can be carried over regardless of season. You can blame the intricate detailing of the handwoven French lace and beads that resembles a bustier for that hefty price tag. I think it's pretty obvious that I am a Céline fan ever since Ms. Philo stepped in as the label's Creative Director. I was actually waiting with bated breath for the SS2013 Women's RTW Collection shown at Paris Fashion Week, and as per usual it was brilliant! Well, to add fuel to my ever-growing fanaticism, I dropped by the shop the other day to check out what pieces from the FW12 collection have been left un-snatched by Céline hungry fasioneistas. And lo and behold there is one more jewel that is up for grabs ladies and gents! Check out this simply mouth-watering Phantom Luggage from Céline' FW2012 collection in a deep red suede material retailing for SGD 2900. Beautiful isn't it? It's lined in lamb leather, with the same deep red color and of course, the handle and outer detailing is made of leather too. I was immediately head over heels! And who wouldn't? It looks absolutely stunning! The only caution to this is the fact that it's made of suede, which will stain lighter colored clothing. Otherwise, it's the perfect piece to have and to hold. If I were you, I'd be running down Takashimaya right now to grab it for my very own as it's the only piece left Otherwise, some other fasioneista will be the proud owner of this beautiful baby. Givenchy is certainly on the rise in the fashion world as we see fashion heavy weights such as Bryanboy & Pelayo profess their love for the label by strutting down in the label's wares every where they go. Well, lucky for us here in Singapore, the label is already well entrenched and I think it is one of the most prolific brands we have that brings haute couture right to your doorstep. For FW12, we see the brand reinventing its key bag designs and I believe you should have seen some of my past posts on the Antigona[CLICK HERE to FIND OUT MORE]. This time around, let's pay homage to my first love - the Pandora. For this season, we see the label adding a ton of texture to their key pieces and it's all in good measure. The result are exquisite, timeless pieces that would be welcome in any bag lover's collection! This Pandora Bag in gorgeous red is made of ostrich skin with gun metal detailing. Retailing for SGD 7500, it is the only piece here in Singapore - making it one of a kind. Unique, eye catching and exquisite best describes this bag and for the price it commands, why wouldn't it no? 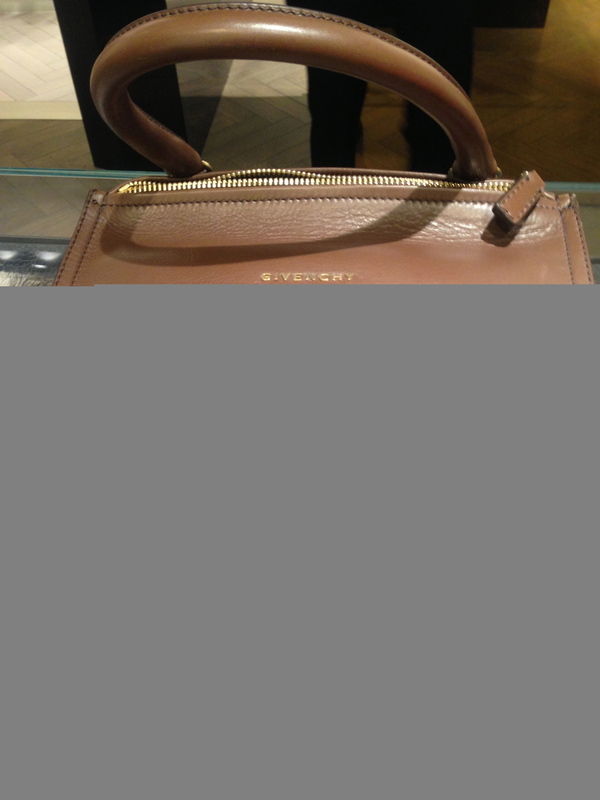 Another bag that caught my eye would be this small Pandora Bag with mink fur in luscious chocolate brown. I loved how supple the leather of the bag is and so does the mink fur. You'd totally just want to hang onto it and hug it! The price tag isn't as bad as that of the latter as this piece will set you back for SGD 2600 only [and this is considering the fact that it has mink on it]. For more photos of the bags, click next! I received a call from the Kenzo boutique here in Singapore to let me know that the Vans by Kenzo collection is now available in stores. Pieces are limited, with quite a few designs. Retailing for SGD280 here, it's a wee bit expensive compared to purchasing it from the US where it's retailing at about USD120. Well, fine, price here is a far cry. But if you're desperate to have one from the collection then I guess you wouldn't mind the price diff since it's basically sold out everywhere else. Anyway, above are the selection for ladies and I am just adoring the yellow colored ones. I was especially keen on the yellow striped one and unfortunately [or fortunately enough in my case], they're biggest size ran a wee bit too small for me. The ones below would be the male selection. Not that much of a fan myself apart from the purple hued one with grids, which I thought was interesting. So which one's your pick? Ok, they just made a video that makes me want to own one. I'm seeing white. All white. ZOMG!